Corian® is a solid surfacing brand created by DuPont that has earned trust and respect as a proven material that brings design versatility, long-term performance and value to any environment. Corian® works beautifully with other materials like wood, stainless steel, glass, natural stone, or DuPont Zodiaq quartz surfacing. Corian® solid surfacing comes in a standard matte finish for a soft, subtle effect; however, it can be polished to a lustrous semi-gloss or gloss finish. 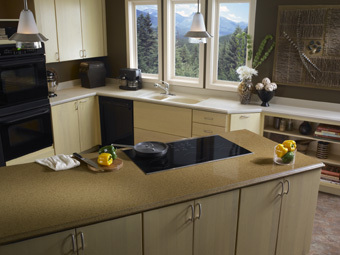 The color and texture of a Corian® go all the way through, from top to bottom. It is a solid material that will not delaminate or come apart. Corian® is made to be renewable. It holds up remarkably well to everyday use and abuse. And while its unlikely to be damaged, cuts and scratches are easily removed with a gentle abrasive cleanser and a sponge. The non-porous nature of Corian® means it resists stains and doesn't need to be polished or sealed. It cleans up quickly with a damp towel, and if needed, common household products. Corian® is NSF/AMSI 51-Certified to the highest level for use in commercial kitchens as a work surface for food contact, for all food types. Options like a Corian® integral sink can create a seamless surface so bacteria and dirt have nowhere to hide. With over 110 colors to choose from and a 10-year limited installed warranty, Corian® is a smart value and beautiful enhancement to any environment.Corian® is a solid surfacing brand created by DuPont that has earned trust and respect as a proven material that brings design versatility, long-term performance and value to any environment.